Designed by an Orthopedic Surgeon, using medical grade materials, Ergobaum Crutches are unsurpassed in form and function. With the highest number of patents for crutches on the market, Ergobaum Crutches promote greater mobility, functionality, and comfort. The sleek, ergonomic design is elegant in its practicality as well as appearance. We take pride in our unsurpassed products and customer service. 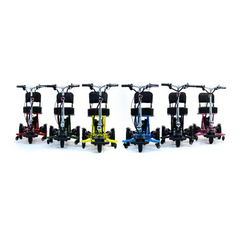 Featuring shock absorbers, LED lights, knee-resting platforms, adjustable grip angle position options, adjustable height options, safety light reflectors, ergonomic padded grips and cuffs, & more. Each crutch weighs 2.8 lbs.